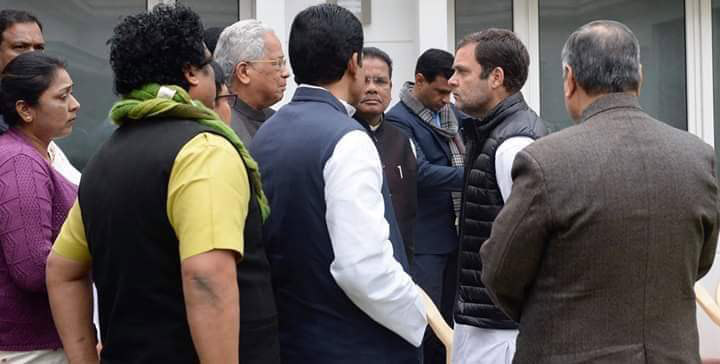 As the NDA-led Centre is planning to get the Citizenship Bill passed in Rajya Sabha in the ongoing session, a delegation of Assam Congress met AICC president Rahul Gandhi on Thursday in New Delhi. During the meeting, they discussed about the strategy to defeat the Bill in the Rajya Sabha. It may be mentioned that the Bill, which was passed in the Lok Sabha on January 8, 2019, is yet to be introduced in Rajya Sabha, where the NDA has not any majority. The role played by the Congress members can derail the move of the BJP-led NDA at the Rajya Sabha. The party’s in-charge for Assam, Harish Rawat on Thursday said Opposition Congress has decided to issue a three-line whip in Rajya Sabha to vote against Citizenship (Amendment) bill, 2016. Rawat also said the decision was taken at the highest level of party to ensure that the contentious Citizenship (Amendment) Bill 2016 is not passed in the Upper House. Rawat led a delegation from Assam including president of Assam PCC Ripun Bora and Leader of the Opposition in Assam Legislative Assembly,Debabrata Saikiato meet the AICC top leadership over the issue of Citizenship (Amendment) Bill. Meanwhile, about 400 youth Congress activists from Assam and different parts of Northeast were detained by Delhi police on here Thursday. The activists were trying to gherao the residence of Union Home Minister Rajnath Singh protesting against the Citizenship (Amendment) Bill, 2016. The agitators tried to proceed towards the house of Rajnath Singh at 17 Akbar Road but they were detained by the security forces from the Congress head office at 24 Akbar Road. “We want withdrawal of the Citizenship (Amendment) Bill. This Bill has posed a serious threat to the indigenous people of the Northeast,” said Ujjawal Konwar, a youth Congress activist from Assam. The detained agitators were taken to the Tilak Marg Police Station and they were released in the evening. The Citizenship (Amendment) Bill, 2016, which was passed in the Lok Sabha on january 8, 2019, is yet to get Rajya Sabha nod. The NDA government at the Centre, which wants to get it passed in the Rajya Sabha, is likely to introduce the Bill in the Upper House of the Parliament in the ongoing session. The Citizenship Bill seeks to provide Indian citizenship to Hindus, Jains, Christians, Sikhs, Buddhists and Parsis from Bangladesh, Pakistan and Afghanistan after seven years of residence in India instead of 12 years, which is the norm currently, even if they do not possess any document.